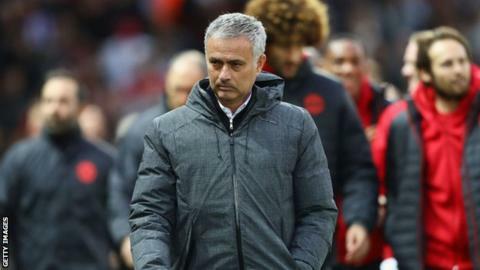 The Champions League and Europa League semi-final draws take place on Friday, with Manchester United the only Premier League team still in Europe. Jose Mourinho side's beat Anderlecht 3-2 on aggregate on Thursday to reach the last four of the Europa League. United could face one of Ajax (Netherlands), Celta Vigo (Spain) or Lyon (France) in the draw at 12:00 BST. The Champions League semi-final draw, featuring Real Madrid, Juventus, Monaco and Atletico Madrid, is at 11:00. Real are the defending champions after beating city rivals Atletico in last year's final. The draws will be made at Uefa headquarters in Nyon, Switzerland. Who can stop Man Utd? Manchester United are now just two games away from reaching the Europa League final after Marcus Rashford scored the winner in extra-time at Old Trafford. The Red Devils boast strong pedigree in Europe with three Champions League/European Cup wins, but have never won the Europa League/Uefa Cup. Ajax, who beat Schalke 4-3 on aggregate to reach the last four, are also experienced European campaigners. They have won the Champions League/European Cup four times previously and the Europa League/Uefa Cup once, beating Torino in the 1992 final. Seven-times Ligue 1 winners Lyon enjoyed their best-ever result in Europe when they reached the semi-finals of the Champions League in 2010, while Celta Vigo have never won a major European competition. The Champions League semi-final first legs take place on 2 and 3 May, with the return legs the following week. The first legs of the Europa League semi-finals are on 4 May with the second leg on 11 May. Real the real deal again? Last year's Champions League winners Real Madrid, aiming to win Europe's premier club competition for a 12th time, beat German champions Bayern Munich 6-3 on aggregate to reach the last four. Atletico, meanwhile, ended Leicester's fairytale run in Europe, edging the Foxes 2-1 over two legs. Juventus claimed an impressive 3-0 aggregate win over Barcelona while Monaco defeated Borussia Dortmund 6-3. The Champions League final takes place on 3 June (19:45 BST) at the Principality Stadium in Cardiff, Wales. The Europa League final takes place on 24 May (19:45 BST) at the Friends Arena in Stockholm, Sweden.